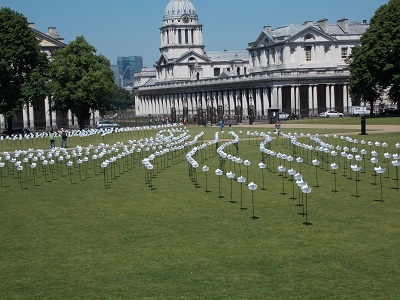 Whilst enjoying the sunshine in Greenwich, I came across the Return of the little ships: an installation in Greenwich in front of the Royal Maritime Museum. 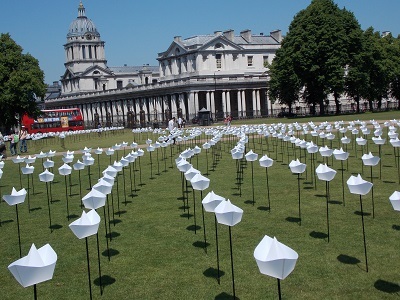 The installation celebrates the anniversary of the 1940 Dunkirk evacuation of troops from the beaches by a large number of small ships. In mid May 1940, the British and Allied Forces were desperately fighting to stop the German advance through Europe, but the decision was made to evacuate the Allied Forces in the North from a small area around Dunkirk. On the May 27th, the Ministry of Shipping requested that all small craft that were capable of taking troops off the beaches should be made available, the small craft were particularly important to reach parts of the beaches where the larger ships could not penetrate. 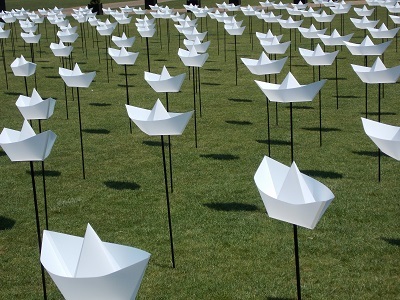 A large number of boats with shallow draughts were assembled to make the dangerous trip across the channel. 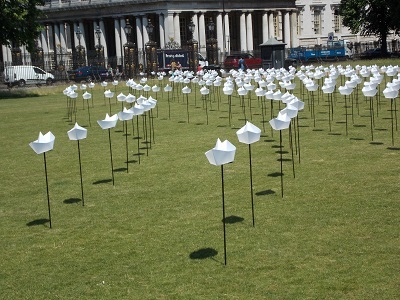 The Little Ships and a fleet of Naval and Merchant Marine vessels operated off the Dunkirk beaches and the harbour between the 28th May and the 4th June 1940 and over 338,000 British and French troops were evacuated. 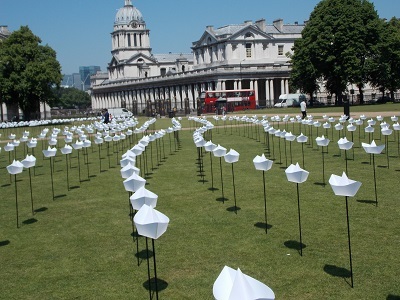 The installation is an attractive and poignant reminder of the bravery of the people involved in the Little Ships rescue who saved a large number of lives. 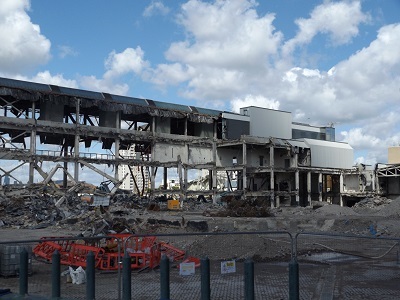 With all the new development in the Isle of Dogs and Canary Wharf, it would have been easy to overlook the demolition of the Westferry Printworks. Although it was only built in the 1980s, the works played an important part in the modernization of the newspaper industry and led to the decline of Fleet Street as the heart of British Newspapers. Whilst many people may remember the Wapping dispute, the newspaper revolution of the 1980s led to the introduction of new technology. 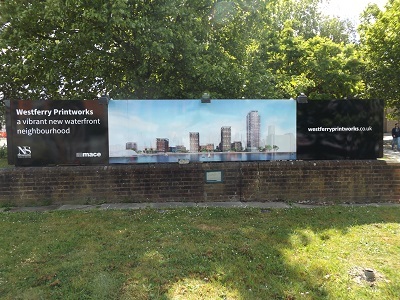 Docklands played a major part in the story with printing facilities set up on the Isle of Dogs, the West Ferry Printing Works of the Westferry road were considered the largest newspaper print works in Western Europe when it was built in 1988. 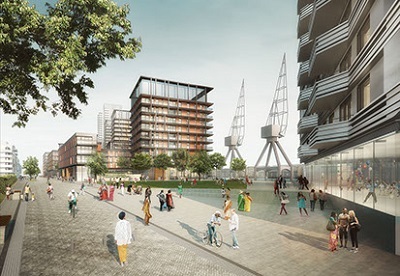 The closing of the docks led to large expanses of relatively cheap land not far from the centre of London. Newspaper owners saw the opportunity to modernise the printing plants and introduce different working practices. This was not completed without conflict which was mostly focused on Wapping. There is some irony that the decline of the newspaper industry has coincided with the rise of land prices in the Isle of Dogs. 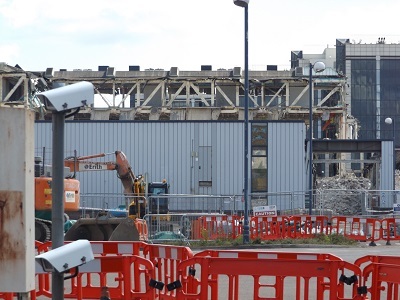 This led to the decision to close the West Ferry Printing Works in 2011, move the works to Luton and redevelop the site. The 15 acre site will provide over 700 new private and affordable homes which will be available to buy or rent. There are plans for open spaces, waterside walks, two new parks and a waterfront promenade. 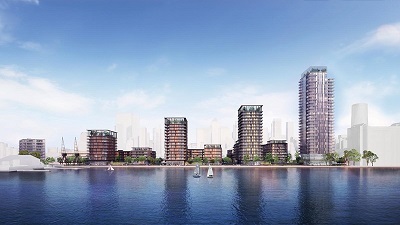 Some concerns has been raised about the future of the Docklands Sailing and Watersports Centre which is near the site and will be impacted by the development. The West Ferry Printing Works has always been quite mysterious, when it was open, you seldom saw anyone go in or come out. The dark mirrored glass made it difficult to see inside. 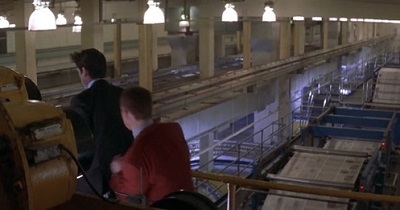 It seemed just the place where a Bond villain would hang out and rather bizarrely the works were used as Elliot Carver’s printing works for his paper “Tomorrow” in the film Tomorrow Never Dies (1997), where James Bond fights with several henchmen. The rise and fall of the West Ferry Printing Works is just the latest of a long line of businesses who have been located in the Isle of Dogs in the last 200 years that became internationally famous before they either closed or moved elsewhere. 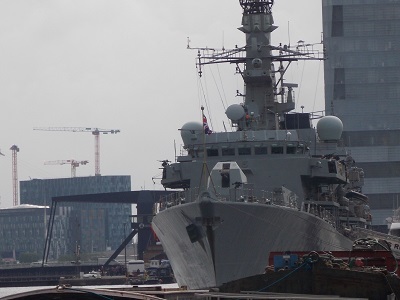 Yesterday saw the arrival of the HMS Richmond, the ship is a Type 23 frigate of the Royal Navy and was launched in 1993. 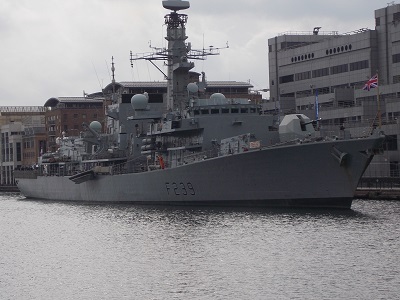 HMS Richmond was last warship to be built by Swan Hunter Shipbuilders. Since her launch, the ship has been deployed all around the world. 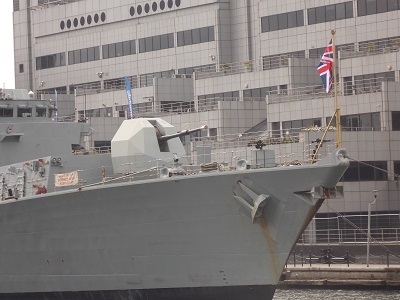 In 1997, the ship was the first Royal Navy vessel to visit the Russian port of Vladivostok in over 100 years. The ship took part in 2003 Iraq War and provided support in the Caribbean in the aftermath of a series of devastating hurricanes. 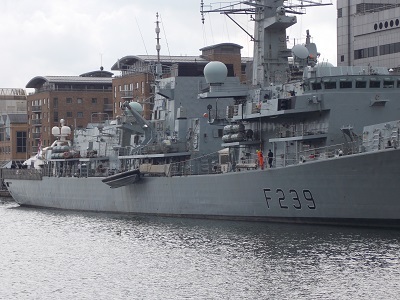 The ship had a refit in 2004/2005 before returning to the fleet. 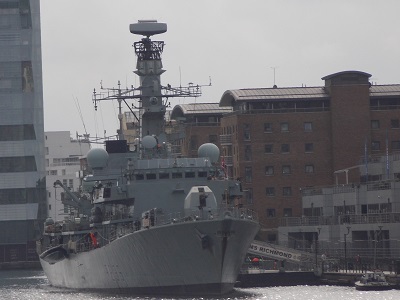 More recently, HMS Richmond and HMS Duncan ( another recent visitor to the dock) escorted a fleet of Russian Navy vessels, including their flagship Admiral Kuznetsov passing through the English Channel. The ship has a length of 133 m (436 ft 4 in) and beam of 16.1 m (52 ft 10 in) and a crew complement of around 185. 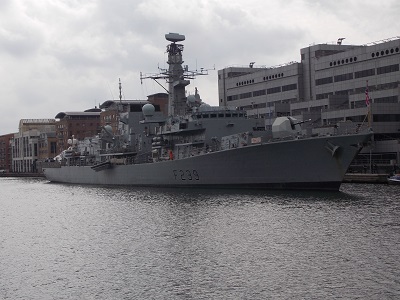 Today, the 13th May 2017, HMS Richmond will be open to the public for free tours, the ship visit will be strictly for ticket holders only ( book on Eventbrite) and the visit will last approximately 60 minutes. 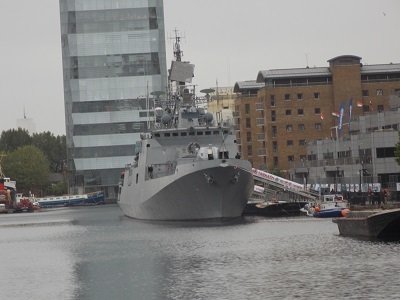 Yesterday we welcomed a rare visitor to the West India Dock with the arrival of the Indian Navy Ship Tarkash. 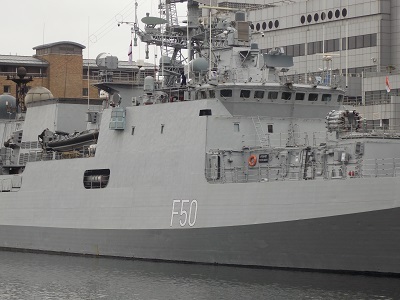 INS Tarkash (F50) is the fifth Talwar-class frigate constructed for the Indian Navy. The ship was built at the Yantar shipyard in Kaliningrad, Russia. She was commissioned to Navy service in 2012 and joined the Western Naval Command on 27 December 2012. 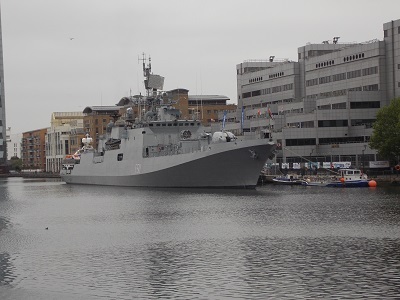 Tarkash belongs to the Talwar class of guided missile frigates which are modified Krivak III-class frigates built by Russia. Whilst much of the equipment on board is Russian made, a large number of the systems were made in India. 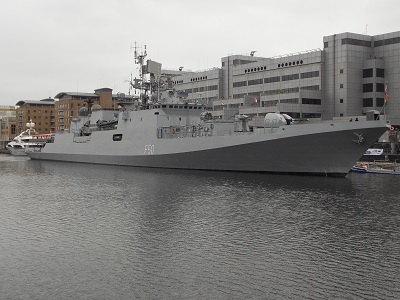 In March 2015, Tarkash was deployed with INS Mumbai and INS Sumitra as part of Operation Raahat to provide protection and support to Indian ships and aircraft involved in the evacuation of Indian citizens from Yemen. The ship was open to the public yesterday and will stay in the dock till the 10th May 2017. 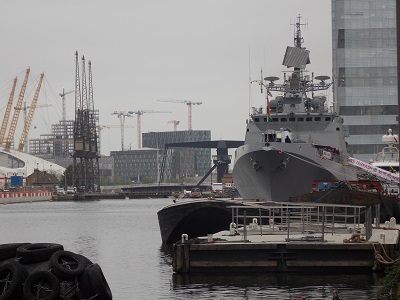 Most of the warships that visit the dock are European, therefore a visitor from India is unusual and offers a rare opportunity to view this particular kind of frigate. Regular readers will know that regular contributor Eric Pemberton is a great collector of postcards and ephemera related to the Island and he often sends some of his latest acquisitions to share with our readers. This week he has sent a fascinating glimpse into the ship building in Blackwall and especially the famous Thames Ironworks. The launching of ships was often great social occasions for the shipyards and attracted enormous crowds. 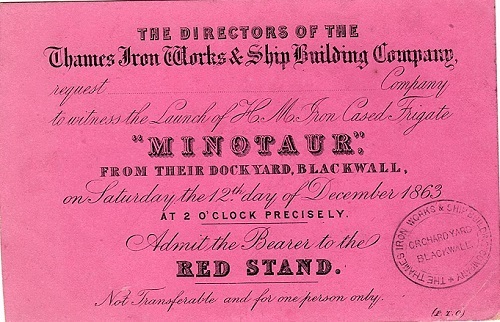 Eric managed to acquire an invitation to one such launch in 1863 of the Royal Navy iron clad steamship Minotaur at Thames Ironworks. The London Illustrated News were present and produced the following report. 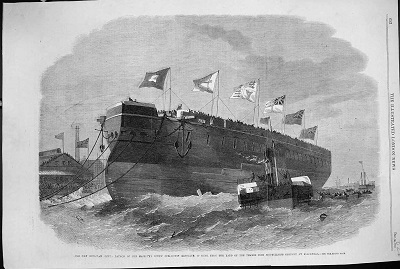 Her Majesty’s iron-clad screw steamship Minotaur launched on Saturday, December 19th, from the yard of the Thames Ironworks and Shipbuilding Company, Blackwall, in the presence of an assemblage computed at 10,000. Admirable arrangements were made by the company for so large a gathering, and although probably not fewer than 3000 persons were conveyed by pontoon and small boats across the creek that divides the yard— the creek into which the ship was launched — not a single accident occurred. The dimensions of the Minotaur exceed those or any other ship afloat; and when the Agincourt is launched from the yard of Messrs. Laird at Birkenhead, and the Northumberland from the yard of the Mlllwall Company, there will be three ships of the class. All three were ordered by the Admiralty on September 2nd, 1861, and should, according to contract, have been launched six or seven months ago; but many changes have been introduced into all the ships, and hence the delay. The launching of the Minotaur was managed to perfection. 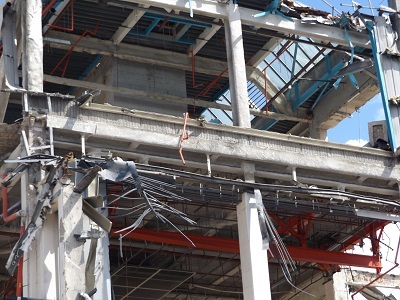 When the last supports had been knocked away, the first effort of the hydraulic ram moved her. Mrs Romaine then dashed the bottle of wine against the iron bows, and the huge vessel glided majestically into the river, amid the cheers of thousands. The work of fitting the Minotaur with her five iron masts,and generally completing her for sea, will be effected in the Victoria Docks. 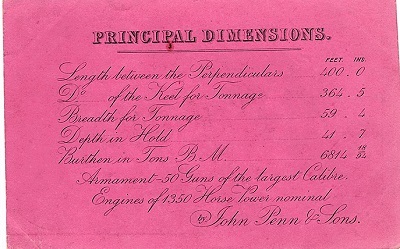 The length of the Minotaur between perpendiculars is 400 ft ,her breadth 59 ft, 4 in., and her depth 41 ft, 6 in. She is of 6814 tons burden, builders measurement, and is to be propelled by engines (in course of making by Messrs. Penn) of 1350 horsepower. Her armament is not yet fully decided upon,, but it is expected that she will carry fifty guns of the largest calibre. 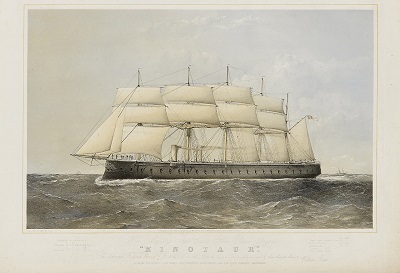 The launching of the Minotaur was three years after the launch of the HMS Warrior which was at the time the world’s largest warship and the first iron-hulled armoured frigate. Following the success of HMS Warrior and HMS Minotaur, Thames Ironworks managed to get orders from navies all over the world which allowed the yard to survive the 1866 financial crisis which closed many shipyards. Minotaur took nearly four years between her launching and commissioning because there was trials with armaments and different sailing rigs. The ship was not a great success and considered slow and sluggish with sails that could not be used in any efficient way. 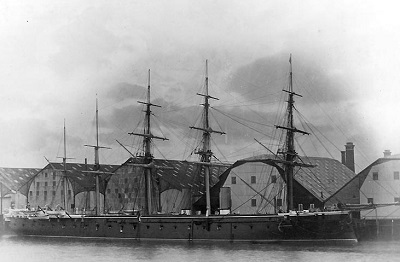 The ship spent the bulk of her active career as flagship of the Channel Squadron, including during the Queen Victoria’s Golden Jubilee Fleet Review in 1887. 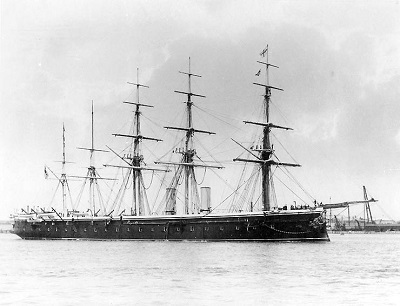 She became a training ship in 1893 and part of a training school at Harwich. Minotaur was then renamed several times before being sold for scrap in 1922 and broken up the following year. Many thanks to Eric for sending us a small reminder of the remarkable shipbuilding heritage of Blackwall and the Docklands area.